After a long night during which the RORC racetracker was estimating that our Team Captain’s boat, the only Royal Cork entrant on the Irish Team, would finish in 25th/26th position, and the chasing pack of lower rated boats seemed to be holding on to plenty of breeze, Antony O’Leary’s Antix held on to her 20th placing. This was enough when Catapult was first on the water and on corrected time was third overall, with Quokka very solid in eleventh place on 27.5 pts to maintain the overall lead for the gallant Irish team. Inshore racing will commence again tomorrow (Wed) and will continue through Thursday before another double scoring race around the Isle of Wight on Friday finishing with a single short inshore race on Saturday. 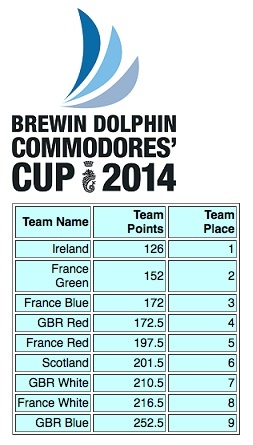 Very well done indeed and many plaudits to the Irish skippers and crews.